Soil Web 200 is a web-based educational tool that provides students with interactive, graphical, video and text-based information to assist them in understanding fundamental soil science concepts. It also relates these concepts to various soil management issues. SoilWeb200 is used to support the lecture and lab-based teaching methods in the APBI 200 – Introduction to Soil Science course. The initial version of the SoilWeb200 was completed in 2004 and this website presents its second edition. 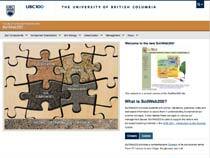 Since the initiation of this soil science educational resource, it has become widely adopted by numerous other natural resources courses at The University of British Columbia as well as other soil science courses at several universities in Canada. Funding provided by the UBC’s Teaching and Learning Enhancement Fund in 2003, 2004, and 2013.